The G1xon features 100 built-in guitar effects, including amp models, distortion/overdrive, modulation, reverb and delay, you can use up to 5 simultaneously per patch. Use the expressional pedal to alter a selected parameter of your patch, from changing the delay mix, to the gain of an overdrive, anything is possible. 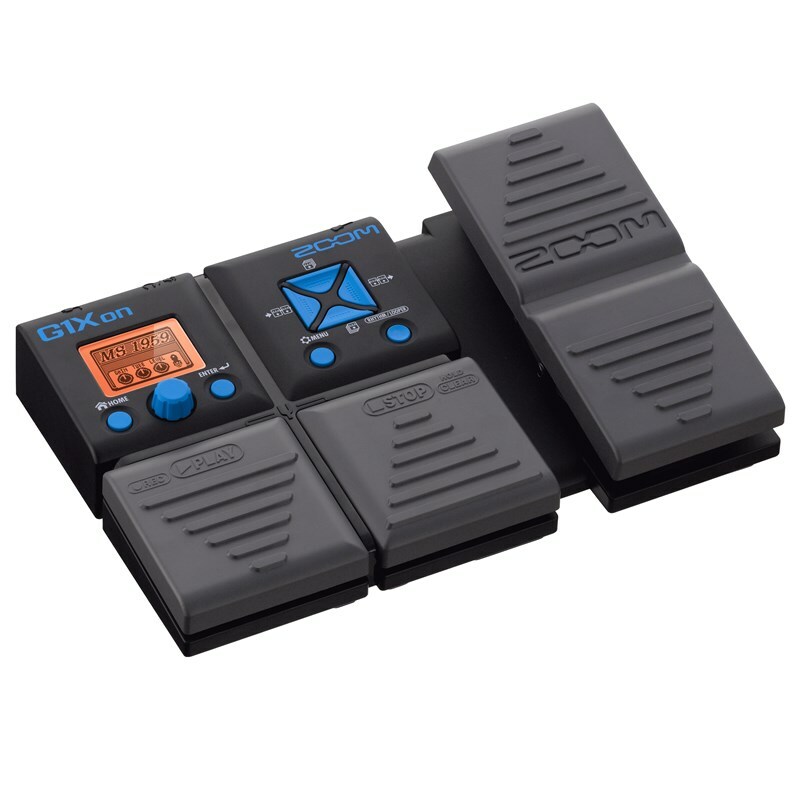 The G1xon is powered by 4x AA batteries or via an optional 9V adapter. 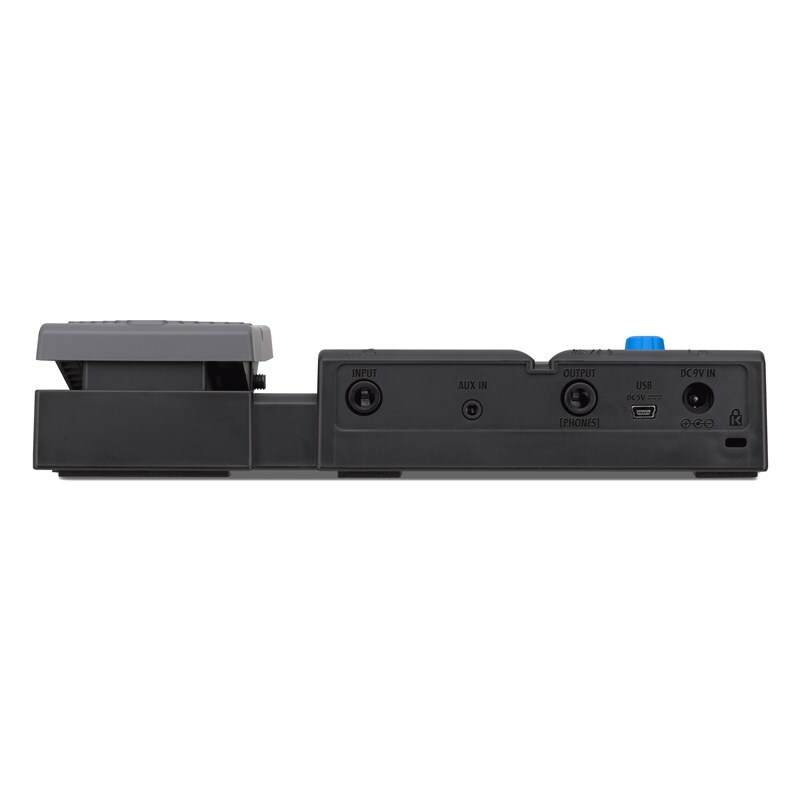 Plug the G1xon into your computer via the USB port to upgrade to future firmware upgrades. Dynamics / Filter - Eleven different ways to shape and control your sound with compressors, noise gates, filters, equalizers and wah effects. Emulate the classic tone of the MXR Dynacomp, dbx 160, Moog Filter or Z. Vex Seek-Wah, or create all-new effects using the automatic Slow Attack, parametric equalizer or six-band graphic EQ. Or choose Zoom's unique Noise Reduction (ZNR) algorithm, designed to remove noise during pauses while still maintaining your guitar's natural tone. Overdrive / Distortion - Twelve of the best boosters, overdrives, fuzzes and lead guitar sounds you've ever heard, including simulations of the BOSS OD-1, MXR Distortion , Marshall Guv'nor, Fuzz Face, Big Muff and Pro Co Rat. Our ExtremeDS effect offers the most powerful gain of any distortion effect in the world, and there's also a simulator that allows your electric guitar to sound like an acoustic. Amp - Twenty-two of the most realistic models ever created, including simulations of classic tube and solid-state amps from manufacturers like Fender, Marshall, Vox, Hiwatt, Mesa Boogie, Orange, Bogner, Matchless and Diezel. Our amp sounds are so lifelike, you'll swear on a stack of speaker cabinets you're listening to the real thing. Modulation / Special effects - Round out your sound with your choice of sixteen phasers and flangers, plus chorus, pitch shift, tremolo and vibrato. 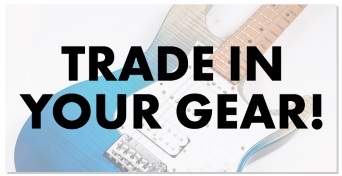 Included are emulations of the ADA Flanger, Boss CH-1 Super Chorus and TC Electronic Corona Chorus, as well as the Zoom HPS, an intelligent harmonizer that plays along in key, and a ring modulator that adds bell-like tones to your guitar. And when you're ready to go after some truly off-the-wall sounds, try out the endlessly rhythmic Slicer. Delay / Reverb - Fourteen delays and natural-sounding reverbs, including rooms, halls, plates, springs, and tape delay simulators, all designed to add depth and spaciousness to your sound, with delay times of up to 4 seconds. 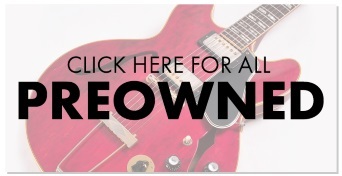 You'll even find reverse delays, modulated reverbs and particle reverbs here-everything you need to place your guitar in a realistic space "¦ or a totally unearthly one. Effects Chaining - Complex multi-effects made easy. Question: When is a guitar effects pedal not just an effects pedal? Answer: When it's a multi-effects pedal. The G1on/G1Xon not only allows you to select and edit any of its onboard effects, it enables you to use up to 5 of them simultaneously, chained together in any order you like. This kind of power and flexibility means that you can create rich, complex effects within the unit itself instead of having to use multiple pedals. Stompbox chains typically start with dynamics effects such as compression, before routing the signal to wah, EQ, distortion and/or overdrive effects. Modulation and spatial effects such as chorus, delay and reverb are usually placed at the end of the chain. However, there are no hard and fast rules on how to chain effects. Exciting new sounds can easily be discovered with a little experimentation and some imaginative effect chaining. The G1on/G1Xon gives you the ability to get creative with your effects chaining. You can also easily edit chains you've previously created. Simple changes in the order of effects can alter sounds dramatically. For example, an EQ set before an amp model can result in a radically different sound than having the EQ set after the amp model. That's because putting the EQ before the amp model serves to not only alter the tonal characteristic of the sound but to act as a signal booster as well. All this can be done internally with the G1on/G1Xon-much easier than physically changing the order of stompboxes. Tuner - Stayin' in tune. Guitarists know the importance of playing in tune. But it's not just about getting your instrument in tune; it's about keeping it in tune all night. That's no problem if you're using a G1on/G1Xon, because its built-in Tuner makes the task totally stress-free, even under the pressure of a live gig and the heat of stage lighting. 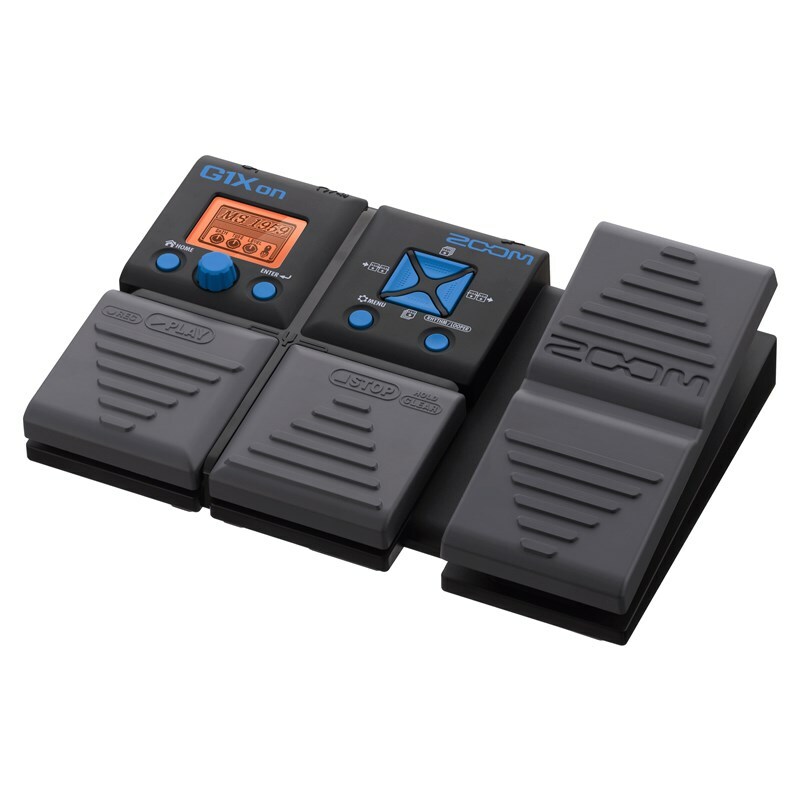 The G1on/G1Xon Tuner is instantly accessible at all times: All you have to do is step on the two foot pedals simultaneously and the backlit LCD screen immediately shows you whether the note you're playing is sharp, flat, or dead on. You can opt to either bypass the currently selected effect (thus giving you a clean, unaffected sound) when tuning, or to mute the signal altogether, allowing you to tune in silence. The G1on/G1Xon Tuner is incredibly flexible, too: It can be set to a reference of A=440, or any value between 435 and 445, and can be used chromatically or in a variety of standard guitar tunings-even drop tunings of up to 3 semitones. Rhythms - The perfect accompaniment. Rhythm training is an important part of every guitarist's craft. The G1on/G1Xon Rhythm function makes it easy and fun to do. 68 realistic-sounding rhythms are at your fingertips: PCM samples of actual drums playing real-life patterns in a variety of different genres-everything from rock to jazz, from Emo to Motown. Dozens of quarter-note, eighth-note and sixteenth-note rhythms are provided, in 4/4, 6/8 (shuffle) and 3/4 (waltz time); for the adventurous, there's even a 5/4 groove! The Rhythm function can also be used in conjunction with the Looper function (see below), allowing you to craft complex guitar orchestrations overlaying the pattern of your choice. Looper - Build a complete performance. Got a great lick that you'd like to expand on, or a distinctive chord progression that you think could serve as the foundation for an exciting improvisation or an inspired solo? Explore your creativity to its fullest with the G1on/G1Xon Looper function, which allows you to layer up to 30 seconds of performance (through the effect or effects of your choice) in high quality audio (16-bit 44.1kHz). Recording time can either be set manually or to a preset number of quarter notes, up to 64 beats, and starting and stopping the Looper (as well as readying it for an overdub or clearing its memory altogether) is as easy as pressing a pedal-no hands required. The G1on/G1Xon Looper can also be used in conjunction with the Rhythm function, allowing you to play along with the pattern of your choice.